Ordinary people like myself occasionally glimpse pieces of truths we believe are important to explain how we live and understand the world but we never seem to get enough distance, or time, or examples to really state definitively what it is that makes us happy, or contentious, or willing to put ourselves out for another. Jonathan Haidt, fortunately, knows how to excavate the origins of our value systems, and has worked with colleagues to theorize and test what we believe and why and to discover the origins of those beliefs. I am thrilled this information is ready for us to use, allowing us to leapfrog decades of daily lived experience. Best of all, Haidt writes in a clear but casual and unstudied way so that the information is easier to absorb. He does not compress all the studies he is telling us about to the least number of syllables or conclusions, but writes as though he were speaking in a spirit of open enquiry. This is particularly important because he is examining the roots of our belief systems, those things that may lead us to diametrically opposed political points of view. At the very end he answers a question I’ve had for quite some time—about the differences and similarities between the liberal and libertarian points of view—that I have never been able to grasp. This book came out in 2012, so anyone who hasn’t had a chance to look at it is placing themselves at a disadvantage in today’s world of political discourse. Haidt freely admits that he is a liberal, and that before he published this book he wanted to put his learning as a social psychologist to use giving liberals insights into their political opponents, so that they might structure liberal arguments to appeal more broadly. He discovered something he didn't expect. He discovered that liberals can be handicapped in their presentation politically because they do not place much emphasis in their thinking on certain foundations of moral thought more commonly used by conservatives. Perhaps more importantly from my point of view, is that in his explanations Haidt shows us the way liberals can move closer to conservative viewpoints without sacrificing the essential contribution progressive thinking makes to a well-balanced society. I firmly believe that neither side on their own has all the correct answers and we need some diversity of thought to innovate at the rate we need to succeed in the future. But we will also need a level of social cohesion or hive mentality which is not available to us at the moment with all the political disagreement. 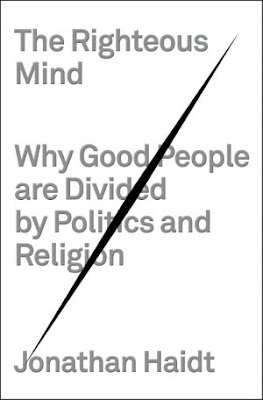 In his concluding chapter, Haidt reminds us that his work shows us that “there is more to morality than harm and fairness….the righteous mind is like a tongue with six taste receptors.” Because not all of us use them all the time doesn’t mean they are not there. Those receptors can be used to construct a moral matrix which will differ with political viewpoint. Conservatives use more moral foundations than do liberals (or libertarians), including Loyalty/betrayal, Authority/subversion, and Sanctity/degradation. Both sides of the political spectrum use Care/harm, Liberty/oppression, Fairness/cheating, but to different degrees. That is to say, liberals define their morality mostly using Care/harm and Liberty/oppression rather than the other dimensions of morality, while conservatives use all six dimensions. Libertarians mostly use Liberty/oppression and Fairness/cheating and only a little of the other four dimensions. Therefore, liberals and libertarians, as you may have noticed, have many overlaps in political goals and tactics that conservatives do not share. This just sounds right, and has been backed up by a number of observations and studies by folks looking at the issue, not from the morality standpoint, but from the competitiveness standpoint. It meshes with something that has been niggling in my mind, around notions of diversity, inclusion and exclusion, nationhood, immigration, bilingual schools. Diversity is fine, good, and necessary for a healthy and inventive society but in the end we have to come together around some basic principles and if we don’t, we have very little indeed upon which to build a nation. Language helps. Social agreement around common tasks is also necessary. I make a distinction between morality as taught in churches by organized religions and moral man, but there is some overlap. Personally I question whether indoctrination by religious groups can get us to social cohesion, but it did work for hundreds of years. The leadership of some churches has been shown to be corrupt; I think religion can work to create social capital, but on a case-by-case basis. Apparently conservatives are more clued into this than are liberals, so liberals among us best take some of Haidt’s lessons to heart. We can’t all do whatever we want whenever we want wherever we want without sharing some responsibility for/to our social group. The good news is that this connectedness is one of the richest experiences we will probably have in our lifetimes. Get this book. It is packed with insights. So many I could write for weeks and not touch all it raises. But it is extraordinarily helpful in sorting through things one may have observed in one’s lifetime, but were unable to substantiate, or formulate into conclusions. Haidt and his group have created the studies, looked at the data, and come to surprising and useful conclusions about our political differences and moral man. Haidt is pleased to call himself a liberal, so it is unlikely he is going to accept wholesale all that Burke, Hayek, and Sowell wrote, but he points out that their notion of social capital is one liberals would probably be wise to adopt.